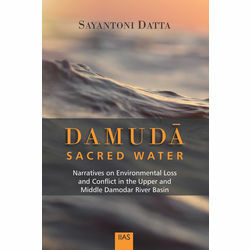 Damudã: Sacred Water, looks at narratives around environmental loss and conflict along the upper valley of the Damodar River Basin in eastern mainland India. The river Damodar flowing through Jharkhand and West Bengal is often used as a poignant metaphor to indicate environmental loss in the lives of local and indigenous folk living here. The upper tract of the Damodar, is a site of large scale industrialisation since the 1950s, home to the oldest coal mines, steel plants and hydroelectric dams of India. On its journey, the book traverses through different spatial remains along this tract... A road: the Grand Trunk Road; a dam: the Damodar Valley Corporation dam, the forests and abandoned coal mine sites, to delve deeper into the narratives around environmental loss and conflict in the upper tract of the Damodar Basin. Attempts are made, along the way, to reclaim and gather again the fragments of environmental wisdom that have been lost over the flow of history in this region. The very name Damudã meaning sacred water in Mundari and Santali, a world view and it's concomitant way of life exist with the people of the Damudã, the mixed communities of tribal and non tribals who have come to live and work here.